Apple (NASDAQ:AAPL) is just a week from the expected launch of the Apple Watch Series 4, along with the newest generation of iPhones. However, while iPhone sales are flat or slipping, Apple Watch sales continue to be solid. Global Q2 numbers show the Apple Watch is not just the top-selling smartwatch, but it is also the top-selling wearable overall. 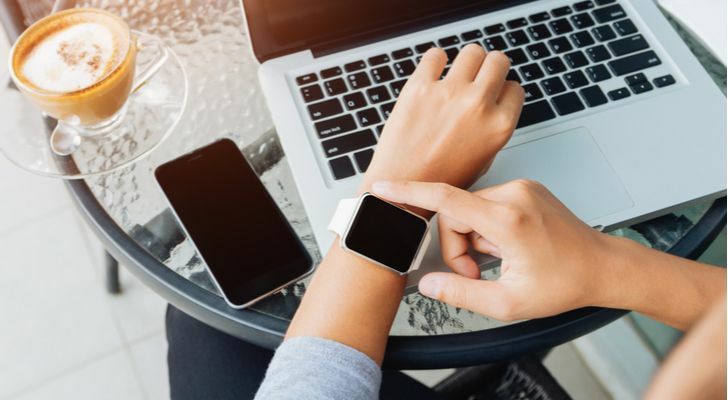 That’s despite competing against inexpensive fitness trackers from China, and the latest smartwatch from Fitbit (NYSE:FIT). Overall, it’s good news for Apple stock. There are several challenges on the horizon, but the release of the Apple Watch Series 4 is expected to address these. Apple Watch sales continue to set the pace for the industry. According to Q2 numbers from Counterpoint Research, the Apple Watch was the top selling smartwatch in the world, with a 41% share. That’s nearly double second place Fitbit, which came in at 21% on the strength of its new Versa smartwatch. Meanwhile, IDC’s Q2 numbers for global wearables put Apple Watch sales on top with 17% of the total market and 38.4% growth compared to Q2 2017. That’s particularly impressive considering second place Xiaomi primarily moved basic fitness trackers like its Mi Band 2 that sells for $25. IPhone sales are still the key driver of Apple revenue (and Apple stock), but Apple Watch sales are becoming an important part of the company’s bottom line and helping the company to diversify. While the Apple Watch sales numbers are good, there are challenges ahead that could have downside for AAPL stock if they’re left unchecked. First, while the LTE-equipped Series 3 (starting at $399) continues to sell well, Counterpoint Research says the Series 1 (starting at $249) accounted for nine out of 10 Apple Watch sales in Q2. AAPL still gets the market share bump, but with a much lower ASP — a number Apple investors have been watching closely thanks to its growing importance when it comes to iPhones. The second issue that looms is a direct threat to Apple’s dominance. To this point, smartwatches running WearOS from Alphabet’s (NASDAQ:GOOG, NASDAQ:GOOGL) Google division have sold poorly. 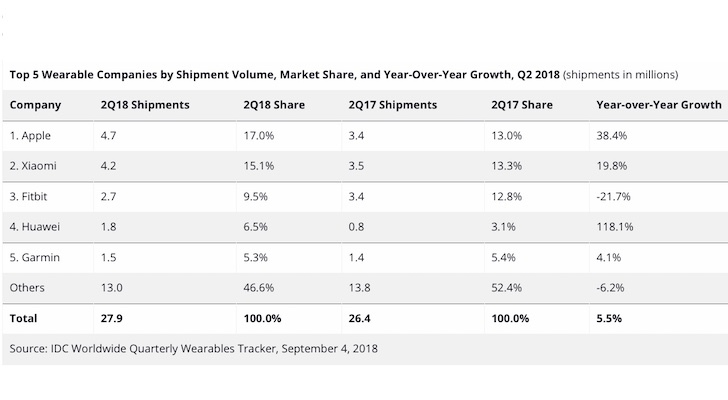 In Q2, WearOS smartwatches had just a 7% global marketshare. But a new generation is due this fall, running the latest WearOS and built around a new processor from Qualcomm (NASDAQ:QCOM) that promises to be a huge leap forward compared to the old version, which was essentially cobbled together based on outdated technology. The danger here is the potential for a repeat of Android catching the iPhone and going on to dominate the smartphone industry. Fortunately for those who invest in AAPL stock, the company is on top of things. The Series 4 has the first significant physical upgrade since Apple released its smartwatch in 2015, with a display that’s 15% larger than previous models (confirmed in photos accidentally leaked by Apple). That improvement is likely to drive a wave of upgraders from early generations. And the new watchOS 5, also releasing in the fall, won’t run on first generation devices, which is likely to further boost upgrades — and Apple Watch sales. The combination of watchOS 5 plus the new Apple Watch Series 4, plus the continued availability of previous generation Apple Watch models at discounted prices provides a solid defense against a potential surge in WearOS smartwatch popularity. The one thing that remains as a cap on the number of potential Apple Watch sales is the company’s refusal to support connectivity between its smartwatch, and Android smartphones. But with an estimated 728 million iPhones in active use as of April 2017 (a number that will have grown since then), Apple Watch sales have plenty of room for growth before bumping into any kind of ceiling. Article printed from InvestorPlace Media, https://investorplace.com/2018/09/apple-watch-sales-remain-strong-ahead-of-series-4-launch/.